A writing journey is like the tape recorder I used in my youth: Sometimes you fast forward, rewind, pause, and play. Other times you are eaten by the recorder, and when you eject, your tape is splayed all over the place: some stuck, some stretched, and maybe even broken. It’s been a privilege and a pleasure to call Kirsti Call not only my writing partner since 2013, but by the title of ReFoReMo Co-Mama. Even though we are separated by hundreds of miles, we’ve been able to record large portions of each other’s journeys. Kirsti recently signed with agent Emma Sector at Prospect Literary Agency, and I KNOW we can learn a lot from her! Hi Kirsti! Let’s put the tape recorder simile to the test. Rewind back to the beginning of your journey. How did you begin building your foundation? Seven years ago, I moved to the Boston area with five kids eight years old and under. I suddenly realized that I needed to pick up my pen and write again. I joined my local critique group, Writer’s Rumpus. Picture books were the perfect length because I was telling my kids stories that I could write down. The Raindrop Who Couldn’t Fall was a story I told my kids at Home Depot! It was my second picture book manuscript and 3 months after I wrote it, Character Publishing accepted it for publication. Wow! What a surprise! And what a happy miracle! How did you know it was time to press play? Getting my first contract motivated me to really delve into working on my craft and learning everything I could about writing picture books. I met Carrie on the 12x12 forum in 2013 and we started critiquing and revising each other’s work almost every day. We helped each other with pitches, queries, and stories. 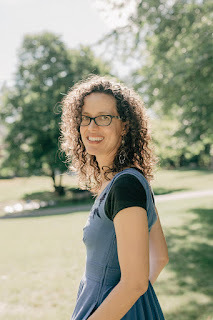 I took online classes: Lyrical Language Lab with Renee LaTulippe, Children’s Book Academy classes, Making Picture Book Magic with Susanna Hill. After The Raindrop Who Couldn’t Fall came out in December of 2013, I started school visits and eventually went to Jane Yolen’s Picture Book Boot Camp. I became a Cybil’s award judge and read hundreds of YA books and picture books. Were you ever tempted to press eject? If so, how did you get back on track? Over the past seven years I've felt encouraged, then discouraged, and ready to press eject, then encouraged again. The publication of Raindrop was encouraging, but when it went out of print after 5 years, I felt disheartened. Despite the disappointment, I submitted to publishers and within 9 months it was out in the world again with Mazo Publishing. Huzzah! Encouraged again! And the cycle continued. I’d get a really good critique, or a really great champagne rejection, and feel some hope for getting my work out there. And then I’d get a frustrating critique or a very negative rejection and feel frustrated again. I paused several times for short spurts to re-evaluate my stories, polish them and make them shine. Did you find the need to rewind again? It always helps to look back at your successes, especially when they feel few and far between. 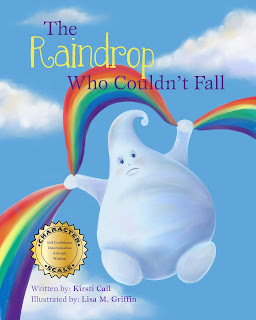 I try to rewind and remind myself of positive steps in my writing journey; becoming an author with Raindrop, a school visit where a kid told me “you’re my favorite author,” glowing critique group feedback, connection and conversations with Jane Yolen. These successes and others helped me continue and persevere in my writing path, and move forward with faith for the future. Thinking back to the beginning, fast forward through your submission attempts and rejections. Would you mind summarizing your submission history record for us? What stands out to you as low and high points? I basically submitted at least 5 times a month (and usually more) for the last 7 years. So I submitted at least 420 times. I had two editors interested in stories that they ultimately didn’t take. I had several agents interested in one of my stories, but not in my other manuscripts. The low point was when I thought I had a sale and even talked to the editor extensively about one of my picture books and then I never heard anything again. So frustrating to hold out hope for nothing in the end! But the high point was definitely that first contract, and holding The Raindrop Who Couldn’t Fall in my hands for the first time! And of course another VERY high point, was signing with Emma Sector! I submitted to Rachel Orr at Prospect through the 12x12, and Rachel sent my story to her colleague, Emma. Emma loved my rhyming 3 little pigs fractured fairy tale, and asked for more work. After she read 4 more of my stories, she asked to read a couple chapters of my YA. Eeeeeek! I felt very unsure about my YA, but I forced myself to press the send button. Emma offered representation over email, without even talking to me. Later that week, we had a conversation and I loved her warm, positive attitude. All of my past rejections led me to where I am now in my writing journey. You were able to record part of your history when you published your first book. Looking at your current collection, what do you hope to record in the future? I hope to catalogue and record many more books in my future. Silly, rhyming picture books, and lyrical ones. My historical fiction YA, and my magical realism MG. I hope that my words make a difference for at least one kid…or adult. As our community pauses to read this, what steps do you feel will make all the difference for them? Write and revise, and write and revise again. Never stop submitting, unless you’re taking a break to hone your craft. And most importantly: Read mentor texts, and lots of them. Reading and studying great picture books and understanding why I liked them has made all the difference for me. We sincerely wish you all the best with your personal writing goals, and we look forward to learning more from you through ReFoReMo. The best is yet to come! Thank you Carrie! Your support has made my writing journey magical! Kirsti Call loves words and putting them together in ways that make people smile. She writes picture books, middle grade and young adult novels. She gets inspiration from her five kids, husband, and backyard chickens. If you visit her house, you’ll likely find her writing, reading with her kids, or singing with her family. 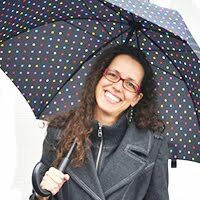 And if you visit her blogsite you'll find her reviewing great books! Really enjoyed reading about your writer's journey, Kirsti! Do you find it hard to switch from writing PB to YA; which do you find "easier" and why? (Sorry, inner-journalist showing her curious side, LOL!). I’m more familiar with PB’s so they are easier for me. I feel like I’m definely still learning when it comes to writing novels. Congratulations on signing with Emma & Prospect Agency, Kirsti! To your continued success! Thank you so much for sharing your journey with us, Kirsti! Your perseverance is inspiring! Great interview! Congratulations on getting your agent! I hope it's the beginning of much more writing fun! Thank you for playing Kirsti’s mix tape for us, Carrie! :D She is an inspiration! Awww. You’re sweet Dow! Thank you! So happy for you Kirsti! This business certainly has its ups and downs, and you've tamed those waves like a pro! Thank you Patricia! I feel blessed to be where I am right now. Congratulations, Kirsti! You work so hard at your craft. I am really very happy for you and can't wait to hear of the many more successes I know you'll experience. Yay! Thank you, Carol, for all of your help on my journey! What a journey! I'm so happy you've landed with an agent you love. I admire your tenacity. Congratulations! Thanks for sharing your story. Hearing about your journey helps me feel more positive about my own. Yay! I’m glad to hear that, David! Congratulations, Kirsti! That's great news- Thanks for your insights and inspiration! Wishing you continued success! Thanks for sharing your story with us, Kirsti! Congratulations! Great interview and congrats to Kirsti! Thank you, Carrie and Kirsti, for this inspiring interview. You ladies bring so much to the writing table! Kristi, thank you for the tips and the spirit. Congratulations! Great post! So excited for you, Kirsti! Thanks Cathy! We're on this journey together! Thanks for sharing the highs and lows of your journey -- grit and determination are so important in this industry! Congratulations, Kirsti! Your perseverence is inspiring! So exciting! Thanks Marianne! Being a part of Writer's Rumpus has definitely helped me improve my writing journey!